The Pyramids - After the construction of the Step Pyramid, Egypt entered a building phase on the grandest of scales. Within a century of the completion of Djoser's monument, Egyptians had perfected the art of pyramid building and wasted no time putting their knowledge to work. The three largest pyramids, the iconic image of Egypt to this day were built during the Fourth Dynasty. They were the Great Pyramid of Khufu, the Pyramid of Khafre and the Pyramid of Menkaure. But these massive projects were a huge drain on the empire. 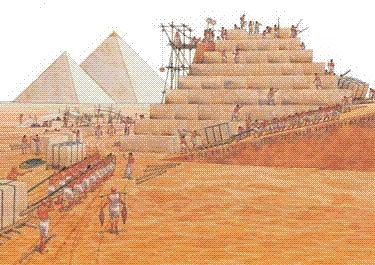 Egypt continued building pyramids, but they got progressively smaller with subsequent pharaohs as the monarchy had to gobble up resources in order to construct them.